I don't remember ever having to work as hard or thinks as long when it comes to a MxMo theme. But ever since JFL of the brilliant blog Rated R Cocktails published the theme of coconut I have been struggling. Ah the Coconut, so round, so firm, so fully packed… with flavor… Coconut is versatile, coconut is magical, not only is it edible but it can be made into scores of products. However, this month you need only concern yourself with the liquid variety as I unveil MxMo Coconut. Yes friends, it is my sincere belief the coconut does not get the love, nay the respect it so richly deserves. Because this easy going tropical seed had its heyday in the Tiki era, it’s happily associated with the same fun loving drinks… Despite all the great Tiki drinks coconut appear in most people are down on the humble seed because of the Piña Colada. Friends, this need not be so; I say we take this delicious ingredient and show it can yield a tasty, well balanced cocktail. It doesn’t have to be tropical necessarily. I’d really love to see some of my friends more classically minded come up with a cocktail more befitting a pre-Prohibition mindset. Because you see - I don't like coconut - as in could live happily ever after, if I never tasted it again. Consider this: I live in Denmark on the 55th parallel. What ever coconut I've come into contact with have been old, stale and in some instances rancid. Or on most other occasions....fake. But I'm not one to turn my back on a challenge. So I persevered. I really did think long and hard how coconut could find it's place in a pre-prohibition gin cocktail but I could not come up with an answer. Instead I kept returning to a trusted friend - the Mai Tai. And I thought what if I replace the orgeat with a coconut syrup made the same way? Switch lime juice with rose hip juice and the curaçao with limoncello? 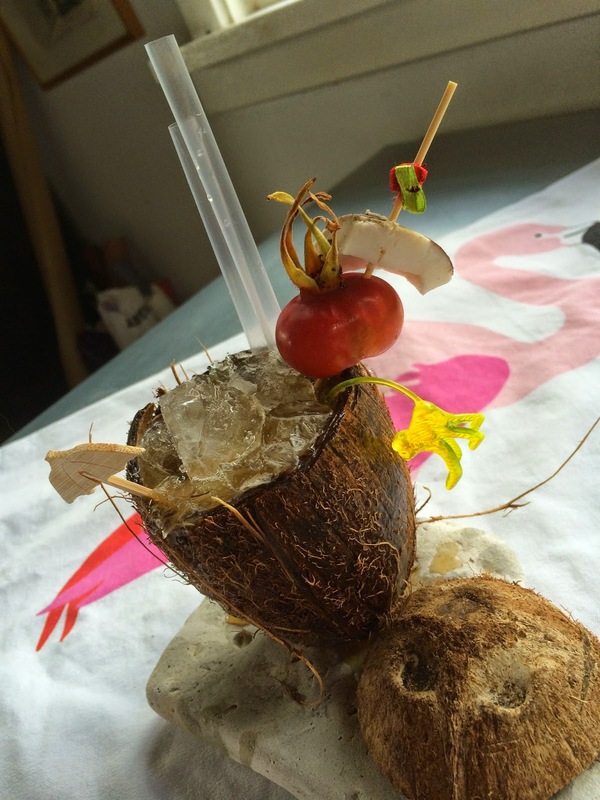 Shake all ingredients with crushed ice, pour into hollowed out coconut, garnish with a piece of fresh coconut and a rose hip. And the name....guess who's coconut leaked......?